Cricothyroidotomy, also known as cricothyrotomy, is an important emergency procedure that is used to obtain an airway when other, more routine methods (eg, laryngeal mask airway [LMA] and endotracheal intubation) are ineffective or contraindicated. Establishing an effective airway in the face of medical emergencies is a skill that healthcare providers must master to prevent patient morbidity or mortality. The only absolute contraindication to surgical cricothyroidotomy is age, although the exact age at which a surgical cricothyrotomy can be safely performed is controversial and has not been well defined. Various sources list lower age limits ranging from 5 years  to 12 years  , and Pediatric Advanced Life Support (PALS) defines the pediatric airway as age 1-8 years. A commercially available set has now been developed for minimally invasive cricothyroidotomy in infants (Quicktrach baby™). The set consists of a plastic cannula over a metal needle for direct placement in the trachea. So far, however, this device has not been evaluated for its intended use. The thyroid gland is ensheathed by the visceral fascia, a division of the middle layer of deep cervical fascia, which attaches it firmly to the laryngoskeleton. The anterior suspensory ligament extends from the superior-medial aspect of each thyroid lobe to the cricoid and thyroid cartilage. The posteromedial aspect of the gland is attached to the side of the cricoid cartilage, first and second tracheal ring, by the posterior suspensory ligament (ie, Berry ligament). This firm attachment of the gland to the laryngoskeleton is responsible for movement of the thyroid gland and related structures during swallowing. For more information about the relevant anatomy, see Thyroid Anatomy. On average, the adult cricothyroid membrane is 9 mm vertically and 30 mm horizontally. Endotracheal tubes with inner diameters of 6 mm and 8 mm have outer diameters of 8.2 mm and 10.9 mm, respectively. The No. 4 Shiley tracheostomy tube has a 5-mm inner diameter and a 9.4-mm outer diameter, whereas the No. 6 has a 6.4-mm inner diameter and a 10.8-mm outer diameter. Each tube comes with an outer cuffed cannula (cuffed tubes are recommended), an inner cannula, and an obturator. For percutaneous cricothyrotomy using the Seldinger technique, materials needed include a finder needle with a dilator and a guide wire (available in cricothyrotomy kits). In an emergency situation, there is little time to provide anesthesia. Often, anesthesia is an unnecessary step that interferes with the acquisition of an emergency airway. If anesthesia is indicated, local anesthesia using 1% lidocaine without epinephrine is appropriate. The patient should be placed supine with the neck in the neutral position and medical personnel standing on the patient's right side. C-spine immobilization should be applied if indicated. There are 3 main approaches to cricothyroidotomy: needle cricothyroidotomy, percutaneous cricothyroidotomy using the Seldinger technique, and surgical cricothyroidotomy (see the videos below). Needle cricothyroidotomy. Video courtesy of Therese Canares, MD, and Jonathan Valente, MD, Rhode Island Hospital, Brown University. Position the patient, apply lidocaine (if indicated), and prepare a sterile field, including cleansing with antiseptic solution. Identify anatomic landmarks (see the images below). 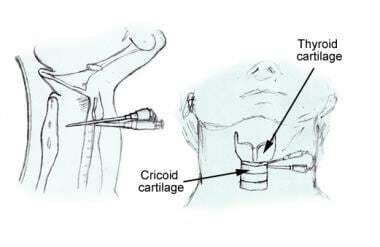 Palpate the thyroid cartilage (the first prominent landmark on the anterior neck), the cricoid cartilage (caudal to the thyroid cartilage), and the area between them, which is the cricothyroid space that contains the membrane. With the nondominant hand, stabilize the area using the first and third digits to either side of the thyroid cartilage, leaving the index finger to palpate the membrane. Cricoid and thyroid anatomy and landmarks. 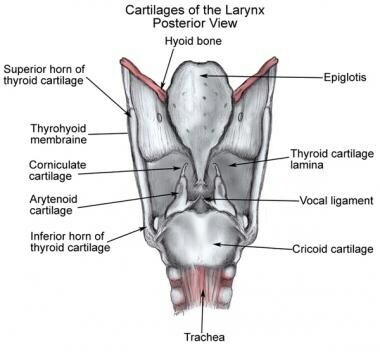 Cartilages of larynx: posterior view. With the dominant hand, insert the angiographic catheter, attached to the syringe filled with normal saline, into the cricothyroid membrane, directing it caudally at a 45o angle. As the needle is advanced, apply negative pressure to the syringe. A distinct pop can be felt as the needle traverses the membrane and enters the trachea. In addition, air bubbles will appear in the fluid-filled syringe. Advance the catheter, and retract the needle. Attach the jet ventilation device, and ventilate at 40-50 lb per square inch or 15 L/min. If this device is unavailable, attach the barrel of a 3-mL syringe to the catheter, and place an endotracheal tube adapter. A bag valve mask (BVM) can then be attached to deliver oxygen for ventilation. Follow steps 1-4 from needle cricothyroidotomy (see above), substituting a finder needle attached to a syringe for the angiographic catheter. Remove the syringe from the needle, and advance the guide wire through the needle. Remove the needle once the guide wire is in place. Use the scalpel to make a small stab incision in the skin close to the guide wire. Place the dilator into the airway catheter, and insert the 2 devices together over the wire. Remove both the dilator and the guide wire once the airway tube is secured in the trachea. Secure the tube in place with appropriate tape. Follow steps 1-2 from needle cricothyroidotomy (see above). With the dominant hand, make a midline vertical incision, approximately 3 cm long and skin deep, over the cricothyroid membrane. A midline vertical incision may result in a small amount of venous bleeding but avoids the laterally located vasculature of the neck. Palpate the cricothyroid membrane through the incision, using the index of the nondominant hand. Make a horizontal stab incision through the membrane. A distinct pop will be felt as the scalpel pierces the membrane and enters the trachea. An assistant should insert the tracheal hook at the superior end of the incision and retract the skin and membrane cephalad. Keep the scalpel in place until the tracheal hook is inserted. If the incision is lost, the location can be identified by means of air bubbles produced during exhalation. If the patient is apneic, apply pressure to the anterior chest wall to simulate exhalation and thereby produce air bubbles. Dilate the incision vertically, using the Trousseau dilator with the nondominant hand. With the dominant hand, insert the tracheostomy tube between the 2 blades of the dilator, directing it initially to one side of the patient. Once the tube is through the membrane, rotate it 90o and insert caudally. Remove the obturator, and insert the inner cannula. Lock it into place. Inflate the balloon with 5-10 mL of air. Attach the tube to a BVM and ventilate. Confirm placement through observation of chest rise, auscultation, and assessment of end-tidal CO2. Sagarin MJ, Barton ED, Chng YM, Walls RM. Airway management by US and Canadian emergency medicine residents: a multicenter analysis of more than 6,000 endotracheal intubation attempts. Ann Emerg Med. 2005 Oct. 46(4):328-36. [Medline]. Sagarin MJ, Chiang V, Sakles JC, Barton ED, Wolfe RE, Vissers RJ, et al. Rapid sequence intubation for pediatric emergency airway management. Pediatr Emerg Care. 2002 Dec. 18(6):417-23. [Medline]. Fortune JB, Judkins DG, Scanzaroli D, McLeod KB, Johnson SB. Efficacy of prehospital surgical cricothyrotomy in trauma patients. J Trauma. 1997 May. 42(5):832-6; discussion 837-8. [Medline]. Erlandson MJ, Clinton JE, Ruiz E, Cohen J. Cricothyrotomy in the emergency department revisited. J Emerg Med. 1989 Mar-Apr. 7(2):115-8. [Medline]. McGill J, Clinton JE, Ruiz E. Cricothyrotomy in the emergency department. Ann Emerg Med. 1982 Jul. 11(7):361-4. [Medline]. Spaite DW, Joseph M. Prehospital cricothyrotomy: an investigation of indications, technique, complications, and patient outcome. Ann Emerg Med. 1990 Mar. 19(3):279-85. [Medline]. Nugent WL, Rhee KJ, Wisner DH. Can nurses perform surgical cricothyrotomy with acceptable success and complication rates?. Ann Emerg Med. 1991 Apr. 20(4):367-70. [Medline]. Bair AE, Panacek EA, Wisner DH, Bales R, Sakles JC. Cricothyrotomy: a 5-year experience at one institution. J Emerg Med. 2003 Feb. 24(2):151-6. [Medline]. Miklus RM, Elliott C, Snow N. Surgical cricothyrotomy in the field: experience of a helicopter transport team. J Trauma. 1989 Apr. 29(4):506-8. [Medline]. Jacobson LE, Gomez GA, Sobieray RJ, Rodman GH, Solotkin KC, Misinski ME. Surgical cricothyroidotomy in trauma patients: analysis of its use by paramedics in the field. J Trauma. 1996 Jul. 41(1):15-20. [Medline]. Robinson KJ, Katz R, Jacobs LM. A 12-year experience with prehospital cricothyrotomies. Air Med J. 2001 Nov-Dec. 20(6):27-30. [Medline]. Roberts, Hedges. Surgical cricothyrotomy. Clinical Procedures in Emergency Medicine. 5th ed. Philadelphia: Saunders Elsevier; 2010. Chapter 6. Holcroft JW, Anderson JT, Sena MJ. Shock and acute pulmonary failure in surgical patients. Doherty GM, ed. Current Diagnosis & Treatment: Surgery. 13th ed. McGraw-Hill Companies; 2010. Chapter 12. Tintinalli JE, Kelen GD, Stapczynski JS, Ma OJ, Cline DM. Surgical airway management. Tintinalli's Emergency Medicine: A Comprehensive Study Guide. 6th ed. McGraw-Hill Companies; 2004. Chap 20. Strange GR, Niederman LG, Henretig FM, King C. Surgical cricothyrotomy. Textbook of Pediatric Emergency Procedures. Baltimore: Williams & Wilkins; 1997. 351. Toschlog EA, Sagraves SG, Rotondo MF. Airway control. Feliciano DV, Mattox KL, Moore EE, eds. Trauma. 6th ed. McGraw-Hill Companies; 2008. Chapter 12. Brofeldt BT, Panacek EA, Richards JR. An easy cricothyrotomy approach: the rapid four-step technique. Acad. Emerg. Med. Nov 1996. 3(11):1060-3. [Medline]. Holmes JF, Panacek EA, Sakles JC, Brofeldt BT. Comparison of 2 cricothyrotomy techniques: standard method versus rapid 4-step technique. Ann Emerg Med. Oct 1998. 32(4):442-6. [Medline]. Ali J. Priorities in multisystem trauma. Hall JB, Schmidt GA, Wood LDH, eds. Principles of Critical Care. 3rd ed. McGraw-Hill Companies; 2005. Chapter 92. Schaumann N, Lorenz V, Schellongowski P, Staudinger T, Locker GJ, Burgmann H, et al. Evaluation of Seldinger technique emergency cricothyroidotomy versus standard surgical cricothyroidotomy in 200 cadavers. Anesthesiology. 2005 Jan. 102(1):7-11. [Medline]. Metterlein T, Frommer M, Kwok P, Lyer S, Graf BM, Sinner B. Emergency cricothyrotomy in infants--evaluation of a novel device in an animal model. Paediatr Anaesth. 2011 Feb. 21(2):104-9. [Medline]. Hubble MW, Wilfong DA, Brown LH, Hertelendy A, Benner RW. A meta-analysis of prehospital airway control techniques part II: alternative airway devices and cricothyrotomy success rates. Prehosp Emerg Care. 2010 Oct-Dec. 14(4):515-30. [Medline].